Applications of nanotechnology are the remarkable sizes dependent on physiochemical properties of nanomaterials that have led to the developed protocols for synthesizing nanomaterials over a range of size, shapes and chemical compositions. Nanomaterials are normally powders composed of nanoparticles which exhibit properties that are different from powders. Nanotechnology is the engineering of functional systems at the molecular scale with their wide applications in energy sector, including -but not limited to- energy resources, energy conversion, energy storage, and energy usage; drug delivery systems including- safety concerns, perspective, challenges, target therapeutics for cancer, neurodegenerative diseases and other human diseases, nanomaterials based tissue engineering; and food sectors including to- food safety and quality, opportunities, challenges, nanomaterials based enhancing food packing, and determination of foodborne pathogens, agro and marine food, analysis of market, regulations and future prospects. The utilization of nanotechnology in the energy field will be emphasized and highlighted, in accordance to their prominent and high impact in this particular field. Recent trends and significant benefits of nanotechnology in the energy field will be revealed to the readers, and their promising advanced applications will be discussed. The current drug discovery paradigm constantly needs to improve, enhance efficiency and reduce time to the market on the basis of designing new drug discovery, drug delivery and pharmaceutical manufacturing. In this book will be highlighted nanotechnology based drug delivery is an important aspect of medicine, as more potent and specific drugs that are particularly discussed the understanding of disease pathways. Several biomaterials can be applied to small-molecule drugs as controlled release reservoirs for drug delivery and provide new insights into disease processes, thus understanding the mechanisms of action of drugs. 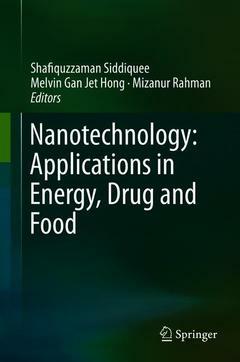 Applications of food nanotechnology are an area of emerging interest for the food industry, for the reason, in this book will be given more priority to discuss the uses of nanomaterials for food packing, food safety and quality, and to remove the contaminated or spoiled by foodborne pathogens. And also nanotechnology based food products will be discussed how making them tastier, healthier, and more nutritious such as vitamins, to reduce fat content, and to ensure they do not degrade during a product?s shelf life. Nanotechnology is basically the uses of nanomaterials, devices and systems through the control of matter on the nanometer scale. Multidisciplinary studies are required the technology for discovery and moving so fast from concept to the reality. Nanotechnology always not only provided more benefits in energy, drugs and food products but also provided significantly benefits around multidisciplinary field applications.